Jupiter is the largest planet in the Solar System, the only body which is heavy enough to have its centre of mass with Sun outside of the star. Jupiter is the largest planet in the Solar System, the fifth body orbiting Sun. With its diameter being 10 times larger and its mass only 320 times larger than the corresponding parameters of Earth, Jupiter's mean density is only one third of Earth's density. The planet consists of hydrogen and helium mostly, providing reason to be classified as 'gas giant'. In the picture Jupiter's atmosphere is visible. The well-known stripes are called belts (darker ones) and zones (brighter ones). Strong winds, jets are blowing at the borders of the belts and zones. In the zones air is moving upwards transporting material from the deeper layers. They contain frozen ammonia crystals which are more reflective than the other gases in the atmosphere, resulting the whitish colour. The reason for the brownish colour of the belts is not known for sure yet. The air in the belts is descending. Powerful winds at the border of belts and zones create atmospheric phenomena like cyclones, anticyclones, storms and even lightning. The most known storm in Jupiter's atmosphere is the Great Red Spot (unfortunately not visible in this image), which may have existed for hundreds of years, the longest existing and also the largest known vortex in the Solar System. Below the atmosphere is the transparent interior atmosphere of molecular hydrogen, in this layer there is no distinct boundary between liquid and gaseous phases of hydrogen, the transition between the phases is continuous as the pressure is increasing towards the core. Below this layer the liquid hydrogen is in metallic state: due to the high pressure hydrogen atoms are not able to hold their electrons, letting the electrons to move independently, like in metals. It is still not confirmed if Jupiter has a solid, dense core under the metallic hydrogen. Gravitational measurements indicated that it may have a relatively small but dense core, however more precise measurements are required to confirm the results. Widely accepted planetary evolution models also require a solid core to be present at least in the early stages of planet formation. Other theories suggest that the initial core may have shrunk or completely eroded by convection currents in the outer layers. Jupiter's rotation around its axis is quite fast, actually the fastest in the Solar System. One complete rotation takes about 10 hours. Due to the fast rotation Jupiter's shape is not spherical, but oblate spheroid, the planet's diameter measured across its equator is about 9200km longer than through the poles. This difference can be observed in the image as well. There are 67 moons known to orbit Jupiter, the four largest were discovered by Galileo Galilei in 1610, they are named as Io, Europa, Ganymede and Callisto. Io is the closest to Jupiter and Callisto is the farthest of the Galilean moons. Io, Europa and Ganymede revolve in 4:2:1 resonance around Jupiter. This means Europa revolves exactly twice, and Io revolves exactly four times while Ganymede completes one orbit. 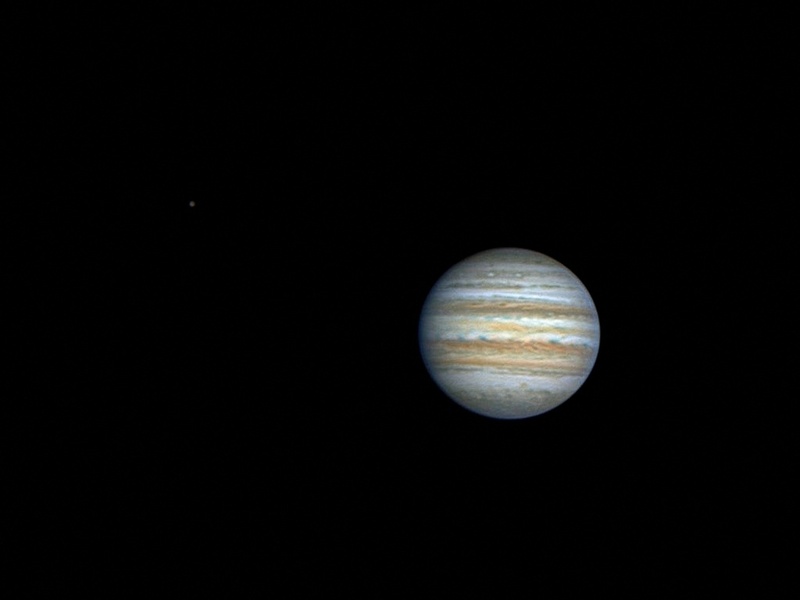 The small dot in the image, left to the planet is Callisto, the second largest of Jupiter's moons. It consists of about 50% ice and 50% rock. Although no details can be observed in this image of Callisto, satellite images show us its surface is being covered with collision craters. The frozen crust of the moon is a rigid mixture of ice and rock. It is assumed that under the crust a layer of liquid, salty water may be present, based on the magnetic properties of the moon. Between the water and a small silicate core, a layer of mixture of ice and rock is located.